Pictured above is the posterior tibialis muscle. It stabilizes your foot & ankle for balance by pulling the bones of your arch toward the back of your lower leg (plantar flexing the ankle) and rotating the bottom of your foot inward (inverting your foot). It attaches underneath all of the muscles attached to the back of your lower leg between the two bones, and its tendon runs down the back inside of your ankle and attaches to most of the bones in the arch of the foot. If this muscle locks up it will feel tight and possibly painful in the bottom of your foot. This muscle is a BIG contributor plantar fasciitis. 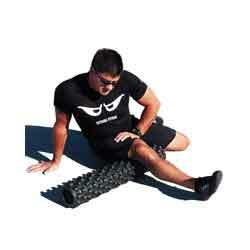 Rarely will this muscle lock up without the toe flexor muscles needing attention too. The soleus muscle ALWAYS needs attention if your posterior tibialis muscle locks up, and your peroneal muscles will also likely need some TLC on the outside of your lower leg. 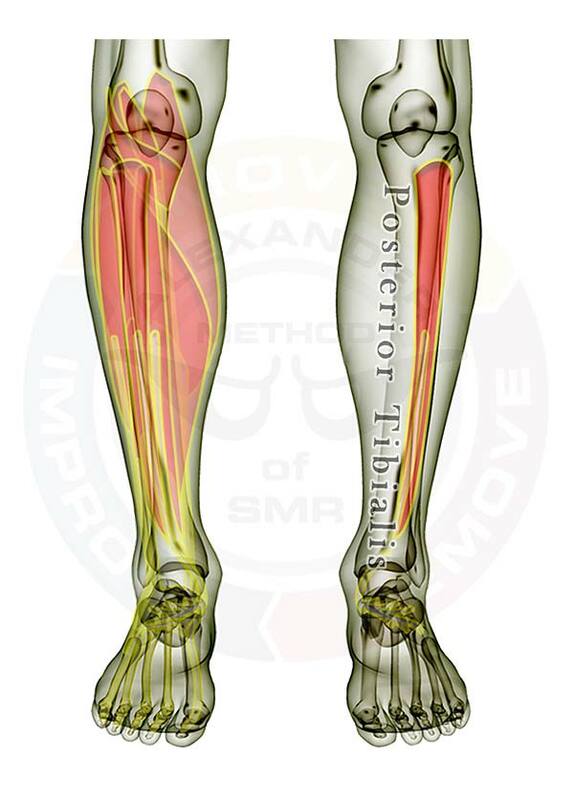 The posterior tibialis muscle is displayed on the right leg. On the left leg the muscles located in the back of your lower leg are layered, showing how some of the muscles are covered by the others. All of the muscles are see-through so that you can appreciate the location and size of each muscle relative to the others. Pictured above is the flexor digitorum longus muscle. It stabilizes your foot & ankle for balance by pulling all of your toes except the big toe toward the bottom of your foot. If contracted hard enough, it pulls the bottom of your foot toward the back of your lower leg like when you point your toes. It attaches underneath the soleus muscle along most of the back of the bigger of your lower leg bones (the tibia), and its tendon runs down the back inside of your ankle and attaches to the bottom of all the toes except the big toe. 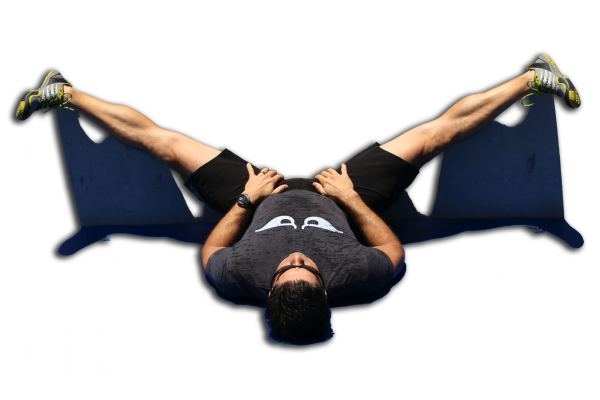 If this muscle locks up it will feel tight and possibly painful along the center portion of the back of your lower leg, and your toes will not move well. This muscle and the flexor hallucis longus are BIG contributors to hammer toes, claw toes, and other general lower leg and foot pains. Rarely will this muscle lock up without the other toe flexor muscle needing attention too (the flexor hallucis longus). The soleus muscle ALWAYS needs attention if your flexor muscles are locked up, and your toe extensors will also likely need some TLC on the front of your lower leg deeper than the anterior tibialis. The flexor digitorum longus muscle is displayed on the right leg. On the left leg the muscles located in the back of your lower leg are layered, showing how some of the muscles are covered by the others. All of the muscles are see-through so that you can appreciate the location and size of each muscle relative to the others. You can access detail for all the muscles in the body with our Coach membership. Pictured above is the flexor hallucis longus muscle (the 'big toe flexor'). It stabilizes your foot & ankle for balance by pulling your big toe toward the bottom of your foot. If contracted hard enough, it pulls the bottom of your foot toward the back of your lower leg like when you point your toes. It attaches underneath the soleus muscle on the lower 2/3 of the back of your lower leg bones moreso on the smaller outer bone (the fibula), and its tendon runs down the back inside of your ankle and attaches to the bottom of only the big toe. If this muscle locks up it will feel tight and possibly painful along the lower portion of the back of your lower leg, and your big toe will not move well. This muscle and the flexor digitorum longus are BIG contributors to hammer toes, claw toes, and other general lower leg and foot pains. Rarely will this muscle lock up without the other toe flexor muscle needing attention too (the flexor digitorum longus). The soleus muscle ALWAYS needs attention if your flexor muscles are locked up, and your toe extensors will also likely need some TLC on the front of your lower leg deeper than the anterior tibialis. The flexor hallucis longus muscle is displayed on the right leg. On the left leg the muscles located in the back of your lower leg are layered, showing how some of the muscles are covered by the others. All of the muscles are see-through so that you can appreciate the location and size of each muscle relative to the others. 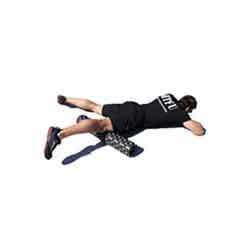 You can access detail for all the muscles in the body with our Coach membership. Pictured above is the extensor hallucis longus muscle (the 'big toe muscle'). 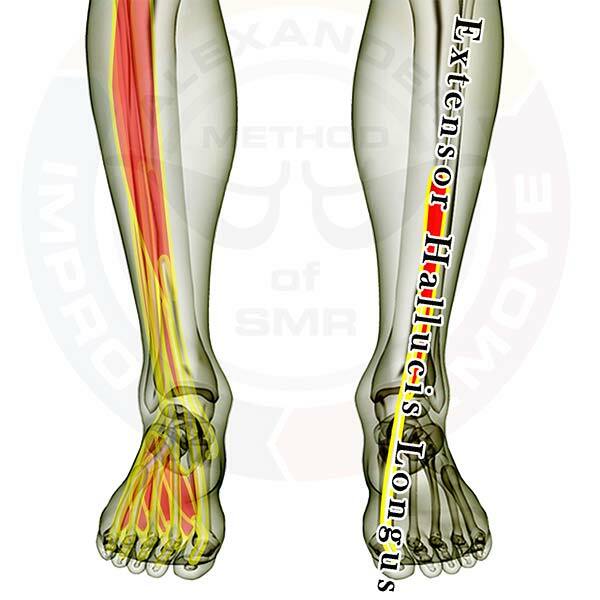 It stabilizes your foot & ankle for balance by pulling your big toe toward the front of your shin. It attaches underneath the anterior tibialis to the lower half of the front of your lower leg bone, and its tendon runs down the front of your ankle and attaches to only the big toe. If this muscle locks up it will feel tight and possibly painful along the lower portion of the front of your lower leg, and your big toe will not move well. This muscle and the extensor digitorum longus are BIG contributors to shin splints, hammer toes, claw toes, and other shin and foot pains. Rarely will this muscle lock up without the other toe extensor muscle needing attention too (the extensor digitorum longus). The soleus muscle ALWAYS needs attention if your extensor muscles are locked up, and your toe flexors will also likely need some TLC on the back of your lower leg deeper than the soleus. The extensor hallucis longus muscle is displayed on the right leg. On the left leg the muscles located in the front of your shin are layered, showing how some of the muscles are covered by the others. All of the muscles are see-through so that you can appreciate the location and size of each muscle relative to the others. Click here to see all of the foot muscles.